Walking on your own is just different. It's not either or, and personally I like walking on my own, with Christine, with a friend or with friends. So today was the first day in a month I've been walking on my own and have enjoyed some of it's upsides. Going as fast as I like and for as long as I like. I have also experienced some of it's downsides, getting lost more often and carrying on too long. I definitely miss more turns and get lost more often walking on my own. Amazing how many times over the last few days Christine has spotted the turn and now, how many times I'm now having to go back because I missed it. As well as walking on my own I'm also in completely different country. It's not completely flat but it's not the Alps. It's now rolling countryside, a mixture of meadow and woodlands and frequent and often prosperous villages. Said goodbye to Christine, tried and failed to buy a map, and was walking by about 9.45. Didn't really finished until after 8 but will come back to the interesting end later. 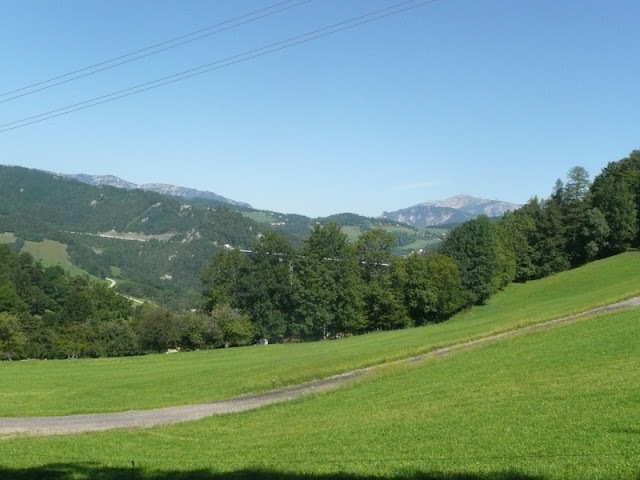 First part of the walk to Maria Shultz was along the same lovely forest trail we finished yesterday's walk on. Dappled light from the bright sunshine above, a level trail soft underfoot, it made you want to walk fast. Into the sun at Maria Shultz and heat of the day hit me for the first time. 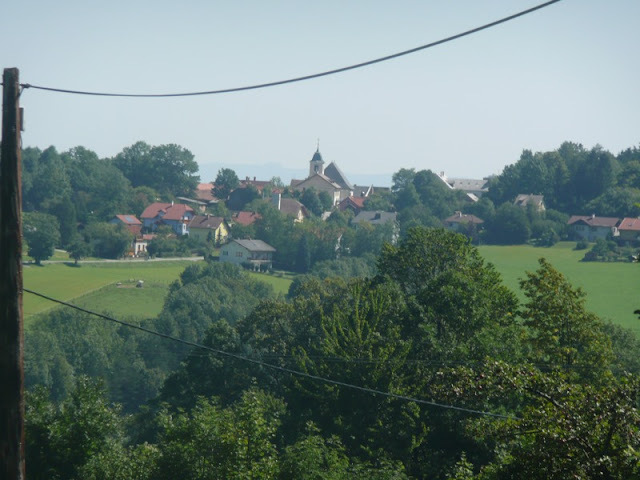 The second part of walk joined up a series of pretty villages - Reach, Egg, Ramssattel - all on a ridge at about 900 metres and overlooking a valley to the north. 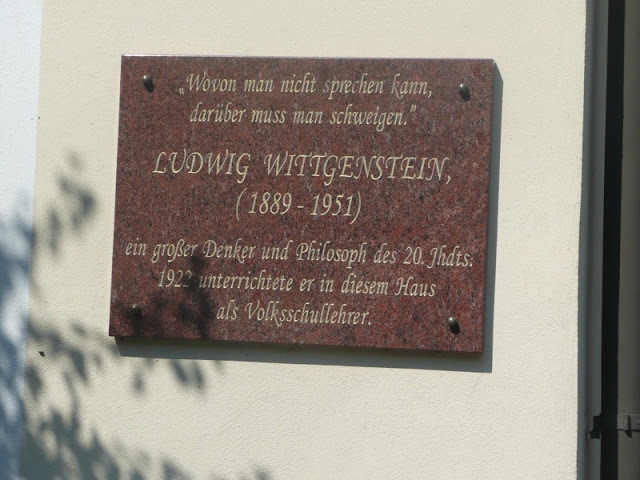 After a long woodland walk, a visit to Hassbach - where Wittgenstein lived for a while - the next part of the walk involved missing the turn near Than and getting lost in the woods for an hour. This should have been the signal to stop, it was five o'clock and there was a choice of gasthofs at Scheilbingkirchen. Instead I decided to press on. The sign said 7 kilometres but that was along the road; the footpath was a lot longer and involved a steep climb at the beginning. 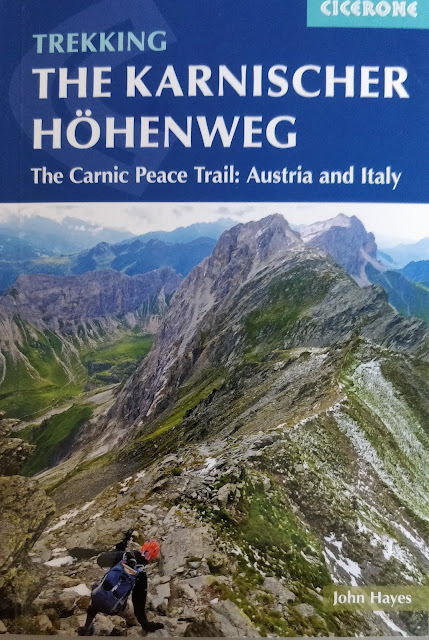 It was actually a nice walk, great views back to the Heukuppe which I had climbed with Christine a couple of days ago and which were now hosting a dramatic thunderstorm, remnants of which caught me just before I got to Bromberg. I was then hit by a worrying new phenomena the gasthof was closed for the holiday. After wandering the streets of Bromberg confirming that there was no alternative I asked a man coming out the Church if he could point to the nearest one, he did and even wrote down the address. It was seven kilometres away. Took of my waterproofs and set off (later discovered I had left my gortex hat). Was sticking my thumb out with no success but after walking for about 20 minutes the man from the church turns up. He had checked the address he had given, found out that they did not do accommodation, but had booked me somewhere else. Dropped me off at my new accommodation and within minutes I was showered, drinking beer and consuming huge quantities of food. Counts as another in the series of E4 walker rescues. John. Indeed walking alone has pros and cons. I do prefer it alone but on certain dangerous terrain it would be grateful to be accompanied. But more than three is a crowd. As to the last post by Christine. I think I have two personalities, the one at home with the daily routines and the mountain-trek one with the dangers, the uncertainties, lack of food, bad wheather, and indeed the beautiful moments being in the great scenery. John your objective is near so enjoy the last part of your great adventure. A little "Trail Magic" ,strangers going out of their way to help, can turn a bad day good. Your absolutely right about the dangerous terrain. Although it wasn't designed I have someone with me on the more scary bits which have fortunately been few and far between.